The campaign worries for this fall reside mainly on the right. But much of the remaining primary action is on the left, as intra-party squabbles that have been on display for half a year play out in a last batch of voting this week. Tuesday is primary day in New Hampshire, with Rhode Island following Wednesday and New York’s state-level primaries held Thursday. Progressive challengers in each northeastern state have made things interesting for establishment favorites — including the incumbent Democratic governors in Rhode Island and New York. But New Hampshire could host the most interesting race of the late-primary season, not least for the state’s outsize role in picking presidential nominees. A congressional district that seems to catch every wave — it’s gone R-D-R-D-R-D in the space of just a dozen years – has an 11-way free-for-all for the Democratic nomination to replace a retiring incumbent. The establishment favorite is being challenged by, among others, a female former Marine captain and Sen. Bernie Sanders’ son (who, intriguingly, does not appear to have caught on in the race). Democrats in the Granite State get one last shot before 2020 to help define the party’s image in the era of President Donald Trump. 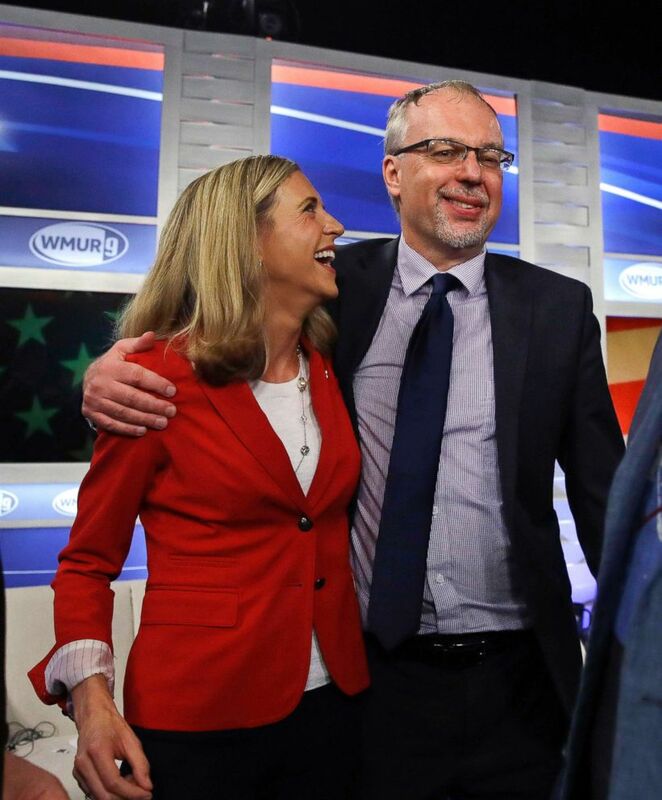 Levi Sanders, right, shares a laugh with Maura Sullivan following a debate for Democratic hopefuls in New Hampshire's 1st Congressional District at the Institute of Politics at St. Anselm College in Manchester, N.H., Sept. 5, 2018. As the Atlantic Coast braces for yet another rough hurricane season, leaders on the Pacific Coast in California have sealed a sweeping climate deal. In response to President Trump’s decision to pull out of the Paris climate agreement, the California bill and executive order signed Monday set two goals for the state: to use 100-percent clean electricity and achieve carbon neutrality by 2045. "In California, Democrats and Republicans know climate change is real, it’s affecting our lives right now, and unless we take action immediately – it may become irreversible,” a top Democratic state senator, Kevin de León, wrote in a statement about the California goals. The move marked yet another aggressive break in policy between the federal government and the country’s most populous state. In the last year, the Trump administration has taken repeated steps to roll back the federal fight against climate change by proposing changes to fuel and population standards for cars and weakening rules about emissions from coal-fired plants. While scientists shudder at suggestions that climate change directly causes extreme weather events, research strongly supports the idea that, because the temperature of the atmosphere is hotter these days, those weather events tend to stay in one place longer, gathering steam and essentially making strong storms stronger. Later this week, climate experts, activists, and lawmakers are set to gather in San Francisco at the Global Climate Action Summit. Puerto Rico Gov. Ricardo Rossello is set to talk about the impact of Hurricane Maria and hurricane experts will discuss the future of extreme weather. 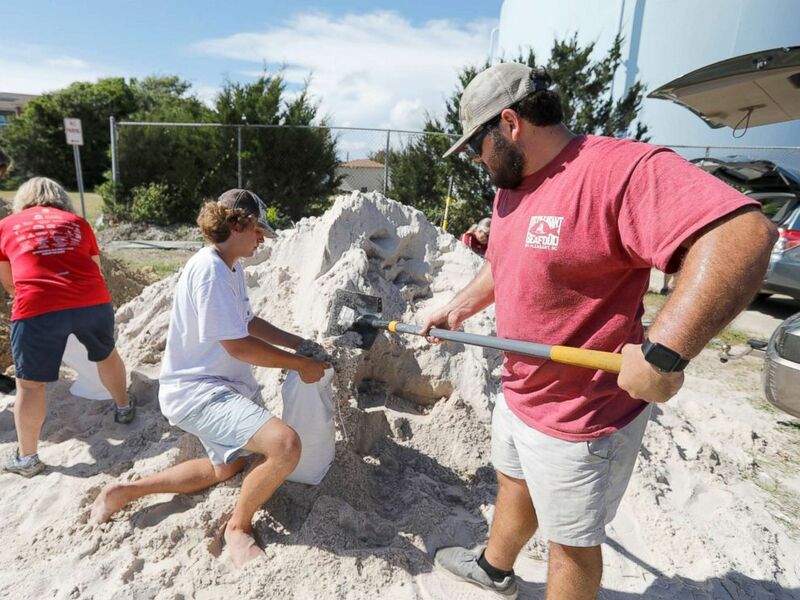 Walker Townsend, right, fills a sand bag while Dalton Trout, center, holds the bag at the Isle of Palms municipal lot where the city was giving away free sand in preparation for Hurricane Florence, Sept. 10, 2018. A Koch-backed organization, the non-profit Americans for Prosperity, is launching a new super PAC ahead of the 2018 midterms — one that can raise and spend unlimited funds to back candidates, bypassing nonprofit campaign limitations – though the contributions must all be disclosed. “Americans for Prosperity has been a difference-maker supporting policy champions in tight races, and AFP Action is a new tool that will allow us to expand those efforts and make an even larger impact,” super PAC spokesman Bill Riggs said in a statement. Americans for Prosperity is a grassroots organization operating in 36 states. Nonprofits can participate in lobbying or legislative activities, but are not allowed to support or contribute to a candidate’s campaign for public office. The creation of the new super PAC — Americans for Prosperity Action — will allow AFP to coordinate support for candidates it likes in contentious races. AFP stated at a donor retreat over the summer that it’s nonpartisan, though it historically has supported only GOP candidates. The group has said it cannot support North Dakota GOP Rep. Kevin Cramer in his bid for the U.S. Senate because of his "inconsistency" on key topics such as trade and spending, part of an overall effort to be more selective. "Bottom line, we need lawmakers to do more, so we need to expect more out of them,” said Emily Seidel, another top AFP official. “That's why we've got a message for lawmakers across the country. We are raising the bar, raising expectations. That's how this network will achieve more." 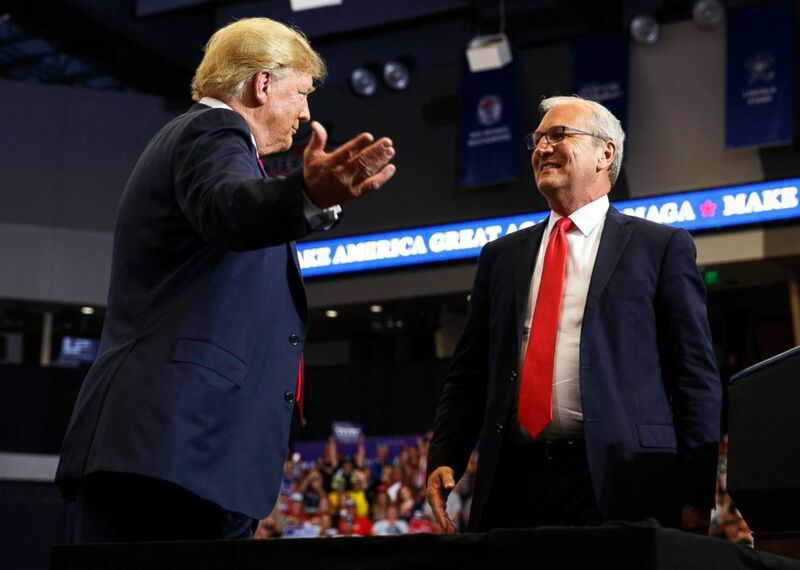 President Donald Trump hugs Senate candidate Rep. Kevin Cramer during a campaign rally on June 27, 2018, in Fargo, N.D.
Today marks the 17th anniversary of the 9/11 terrorist attacks that killed nearly 3,000 people. ABC News Live will be covering today's memorial events. President Trump attends a 9/11 observance at the Flight 93 National Memorial in Shanksville, Pennsylvania; Remarks by Vice President Mike Pence and Defense Secretary James Mattis at the National 9/11 Pentagon Memorial start at 9:42 a.m.; and Attorney General Jeff Sessions delivers remarks at the Department of Justice 9/11 Remembrance Vigil, which starts at 8:45 a.m.
An interview with Donald Trump, Jr. airs on Good Morning America. New Hampshire’s primary is today. Polls close at 7 or 8 p.m. ET, depending on the city or town. Follow our midterm election coverage here. “Fear: Trump in the White House,” Bob Woodward’s new book, is officially released. "Certainly if there was an individual, if that individual is in meetings where national security is being discussed or other important topics, they are attempting to undermine the executive branch which would be problematic and something the Department of Justice should look into," — White House press secretary Sarah Sanders on Monday, when asked about President Trump’s call for the Justice Department to investigate who wrote last week’s anonymous New York Times Op-Ed.